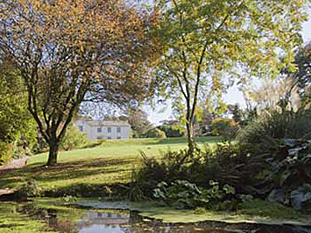 Creed House is a intriguing 5 acre landscaped Georgian Rectory garden in tranquil rural setting with tree collection, rhododendrons combined with sunken alpine & walled berbaceous gardens decorated with Trickle stream, ponds and bog. Natural woodland walks. Restoration began in 1974, includes recent plantings. Creed was built in about 1730 and was formerly the Rectory. 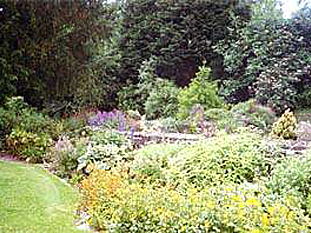 When we took over in 1974 it had a beautiful, nostalgic, forgotten garden – neglected for the best part of 50 years. The front lawn was like a hayfield, with both banks covered in brambles. The rest of the garden was an almost impenetrable jungle, discouraging any attempts at entry. Laurels were festooned with old man’s beard, sycamores and willows seeded everywhere. Set amidst this jungle we could glimpse signs of what used to be a fine garden – the tops of rhododendron arboreum, some 40 feet high, magnolia, huge clumps of Gunnera and water running in and out. We set to work initially on the lawns with a tractor and silage cutter. Then we cut the brambles and nettles around the immediate area of the house. We gradually worked our way into the woodland, particularly down the NW side of the main lawn to find our boundary. We started around the Gunnera and worked our way up to the summerhouse and stable yard. We reckon we felled and winched out some 300 trees between 1974-84, some with root balls above a man’s height. These all had to be knocked out, chopped up and burnt. Then the ground had to be levelled, the lawns seeded and areas marked out for planting. The few remaining good trees were revealed, the outlines of paths and ponds and even buildings we did not know existed. It seems hardly credible that it was sometime before we discovered the derelict remains of what is now the Summerhouse. One of the great delights of the first Spring, after clearing the undergrowth, was that thousands of snowdrops and daffodils sprang to life, principally on both the banks but extending down through the garden to the lower woodland, and the large old Magnolia soulangiana was free to bloom again in unfettered profusion. 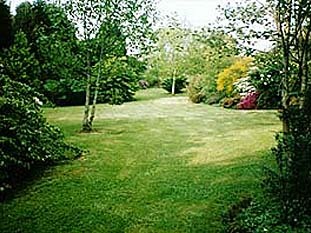 From 1984-93 we have gone back over the whole garden refining and upgrading, and we have been all over the country finding interesting shrubs, rhododendrons and above all trees to plant to give colour and interest throughout the year. From the centre of Grampound, on the A390 halfway between Truro and St.Austell, take the road signed to Creed. After one mile, you will reach Creed Church set back from the road on your right, and a T junction turning to your left, and the house is behind the second white gate on the left.